Both the government and a group of rebel soldiers have claimed victory after a pre-dawn raid on the Paramacay army base in the north of Venezuela. The survivors from the group of twenty rebels made off with weapons. Venezuela's military says it put down a rebellion at a key army base in Valencia, 170 kilometers (105 miles) west of the capital on Sunday, less than two days after the government appeared to ensure its indefinite rule by forming a legislative body loyal to President Nicolas Maduro. 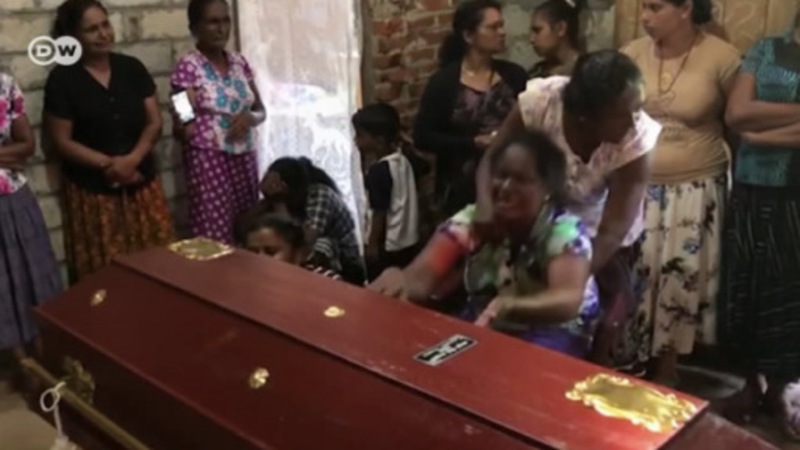 Maduro said in his weekly television broadcast on Sunday that two of the Valencia attackers were killed, one wounded, seven arrested and ten had escaped. Loyal soldiers "responded with the assault rifles of the homeland," the president remarked. "They are being actively searched for," he added, saying they would face "the maximum penalty" for their actions. "We know where they are headed and all of our military and police force is deployed," Maduro added. The intruders had been able to reach the weapons depot at the Paramacay base, Maduro admitted. He congratulated the armed forces for their quick response against what he called the "terrorists." Only one of the men detained was a military officer and the president said he had deserted a few months ago. "A week ago we won with votes, and today we had to win with bullets," Maduro said, referring to the vote for the new legislative body which is to rewrite the constitution. Locals in Valencia said a night time curfew had been imposed, with helicopters flying overhead and armored vehicles patroling the streets. A video was released almost the same time as the attack was taking place on Sunday. 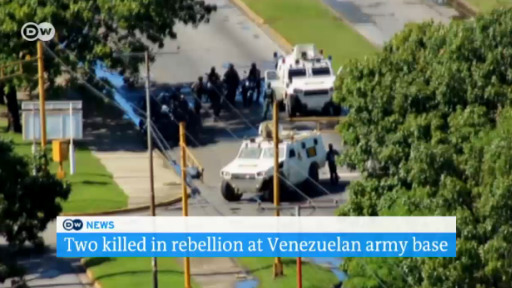 It showed armed men in military uniforms and a spokesman identified by local media as Captain Juan Carlos Caguaripano, a dissident National Guardsman. Caguaripano said his men were not looking to stage a military coup, but were taking a "civic and military action to re-establish constitutional order," for a "transitional government and free general elections." "The time has passed for secret pacts and deals between tyrants and traitors," the spokesman said as he urged security forces to "display banners alluding to 350" in reference to Article 350 of the Venezuelan Constitution. This encourages citizens to "disown any regime, legislation or authority that runs counter to democratic principles." In 2014, the military issued an arrest warrant for Caguaripano and 30 other soldiers after he had called for a rebellion, saying the "armed forces cannot be and are not indifferent" to what he called a "Castro-Communist system," a year after Maduro had taken over the presidency from Hugo Chavez. The armed forces are seen as the key power broker in Venezuela, and opposition leaders have repeatedly called on the military to break ranks with Maduro. But the military leadership has continued to publicly profess loyalty to the president and his government. Critics say lucrative government contracts, corruption and contraband mean many military officials want Maduro to stay in power. They also fear persecution should the opposition take over. So far the rest of the country appears to be remaining calm, if tense. Critics at home and abroad have condemned the new constituent assembly that held its first session on Friday. It is intended to replace the National Assembly, which has a majority of opposition politicians. The new constituent assembly quickly moved to dismiss the state prosecutor, Luisa Ortega, a former ally of Maduro's who has recently become his staunchest critic. Ortega refused to recognize the assembly's move as she vowed to resist the Maduro regime "with my last breath" against what she considers the government's unconstitutional over-reach. The new constitutional assembly is expected to meet again Tuesday, while the opposition-controled National Assembly has scheduled a session for Monday, with opposition leaders calling for renewed protests. The opposition boycotted the vote for the new constituent assembly. Venezuelan authorities have detained a group of soldiers and civilians and recovered some of the weapons stolen in the recent attack on an army base. Officials said that one of the fugitive suspects was living in Miami. A major cyberattack has shut down dozens of Venezuelan websites, including several for government bodies. The group behind the hack has lent its support to a rebel campaign against President Nicolas Maduro.